It's estimated that more than 70% of people over the age of 60 will develop cataracts, which occur when the lens of the eye becomes cloudy. Since the cataract interferes with light passing through the eye, it makes it more difficult to see clearly. Cataract surgery involves making a small incision to insert and ultrasound probe to break up the cataract and suction away the cataract material. A new lens is then inserted through the small incision. Cataract surgery is performed on an outpatient basis. Patients will go home the same day after the ophthalmologist performs their surgery. Cataract surgery is scheduled on Fridays at CCH with Dr. Matthew Rauen from Wolfe Eye Clinic usually every 6 weeks. A visit to a specialist at CCH Specialty Clinic's means you'll receive professional health care in a convenient, close to home setting. 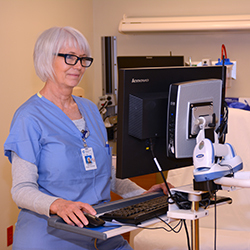 When you have questions, you can call the hospital's Specialty Clinic Staff to receive assistance and be connected with the medical specialty you need.